My gaming appetite is diverse. I'll happily consume story driven epics of grandiose proportions alongside my daily zombie killing escapades. That being said, some of my favorite games have been quiet additions to my normal routine. Games that I will never talk about, for whatever reason, routinely surprise me with how engaging they are, despite being no innovative cup of tea. Sometimes, as Michael Abbott of the Brainy Gamer laments, "critical discourse surrounding games gravitates to and celebrates the new while overlooking the familiar." There is one particular DS game that I owe more than a cursory glance. The newest addition to a franchise that accomplishes nothing extravagant, but everything skillfully, Professor Layton and the Diabolical Box is one of my favorite gaming experiences of this year. Developed and published by Level-5 (the creators of a Dark Cloud, an old RPG favorite of mine), the creators have earned every ounce of praise for their subtle success. 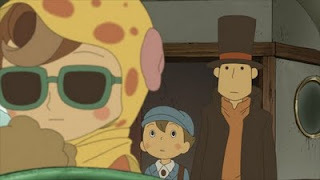 For those new to the series, Professor Layton and the Curious Village, along with its sequel recently released in the U.S., Professor Layton and the Diabolical Box, follows the adventure of the titular academic and his young apprentice Luke as the traipse around towns and trains solving riddles. Each game features a longer narrative broken up into segments. While the Professor pursues answers to a larger puzzle, townsfolk offer up an assortment of riddles. I found this particular story driven point-and-click adventure late. By the time I got my hands on the Curious Village, the game was already highly regarded by a seemingly vocal fan base. My response, happily given to those would listen, is that Professor Layton had no right to be this good. Not only is the Layton series a success, but at a glance, it does nothing extraordinary to deserve it. Many of the puzzles in Diabolical Box are variations on those found in Curious Village, and are themselves variations on any puzzle you might find in a book on brain teasers. They often test the player's spacial reasoning, logic, or ability to move object around for one reason or another. The story, in any other context, would seem muddled with frequent interruption. The number of times a total strange demands an answer to a riddle is almost ridiculous, even when a serious circumstance would make such inquiries entirely inappropriate. Coupled with mini-games and mini-mysteries, Professor Layton should be no more than a collection of distractions for your weekly commute. However, Professor Layton (and I include both U.S. released titles in this statement) is far more than a patchwork puzzler. Although both games include excellent animation and voice acting, with an engaging story carrying the entire piece forward, it is the imbued sense of mystery that makes this game shine. Each normal puzzle makes up the game's basic interaction. 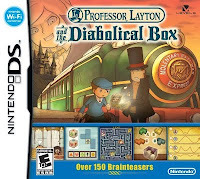 In the Diabolical Box, alongside these puzzles is a hamster mini-game, a camera mini-game and a tea-brewing mini-game, which help the player along the way and add optional teasers to the game's vast collection. There are also small mysteries Layton and Luke solve during their journey, which each play in part in solving the over-arching mystery. Professor Layton is submerged in puzzles. The game doesn't bend genre as much is it bathes in it. The art and story design, put together with loving care, is in service to the idea of mystery. Until the very end, the player is always immersed in puzzles, from the moving match sticks, to revealing a person's identity, to solving murders. The entire game is an ode to riddles. Layton is the most charming detective since Angela Lansbury, and his devotion to puzzle solving is infectious. From the beginning, with its dialogue and fluid hint system, Professor Layton is welcoming. When each game wraps up, when Luke and Layton solve the mystery of the week, the satisfaction of finding a single solution is magnified. The game becomes a conglomeration of riddles and eased frustrations. 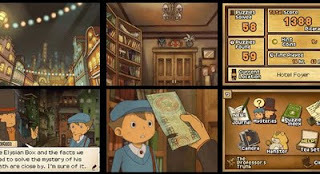 Professor Layton, without flare or vanity, is more than a collection of puzzles, it is a solvable and inviting piece of art devoted to the magnificence of curiosity. The Professor Layton games are on my wish list... The descriptions of them remind me of the things I loved in an old childhood favorite duology The Castle of Dr. Brain and The Island of Dr. Brain. Two of the best from Sierra's education side. I just hope that somebody reads this and decides to pick up one of the Layton games. They really are fantastic, and they really have no right to be as wonderful as they are. In a way they kind of highlight how arbitrary most challenges in games are. But it doesn't really matter because they've constructed such a self-consistently nonsensical world that you just accept it for what it is. The Island of Dr.Brain was awesome, thanks for reminding me. The care Sierra envisioned and encouraged exploratory learning in a artistically pleasing package is very similar to the care Level-5 put into Layton. Calling the Layton games 'Self-consistent' is an excellent way od describing them. I think it is a successful example of gameplay meshed with story, particularly the Curious Village. I hope people give these games a look as well. I agree with Julian, I hope someone reads this and is inspired to try one of the games because they are absolutely wonderful. Well, the original is, haven't quite gotten around to The Diabolical Box just yet. The series is popular, but I get the impression that its following is more on the cult side than anything else, so if posts like these (and hopefully my own when I get around to it) can motivate people to check it out then that can only be a good thing. I've been on the 'outside' of DS gaming for a while, but it seems like we take for granted just how many different, and more importantly, unique games the platform has. It feels to me like we definitely should be paying more attention to individual titles, so props to you for keeping Layton's boat afloat. Jeez, I'm going to feel like a common bridge troll saying this..
Am I the only person who was not particularly impressed with Professor Layton and the Curious Village? I found that the puzzles.. while fun from the standpoint of those folks who enjoy brain-teaser books.. were indelicately shoehorned into the story? It seemed like the puzzles were only tangentially related to the plot, and because of that tended to distract from the flow of the story. To give this a bit more meat, compare the puzzle quality to Myst, Still Life, or Betrayal at Krondor. These games are very different, but managed to integrate their puzzles perfectly into the game world. In both of these games I never find myself straining to see how the puzzle relates to the plot or the world; usually the puzzle serves to pull the plot along just a little further and add some more detail to the world. 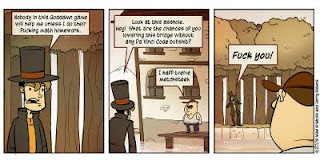 Layton never managed to do that for me. On the inverse, the story seemed to be an excuse to prompt me with puzzles. If anything, the gorgeous animation (reminiscent of the Broken Sword series) kept me going for a while, at least until the puzzle-after-puzzle gameplay style dragged me into oblivion. I'm also surprised how many excellent titles are being released for the DS. Brainy Gamer Abbott seems keenly aware of innovative, or iterative, success stories on the handheld too. I think it would be a great time for gamer newcomers to try their hands on DS games. I'm sorry the Layton series didn't please you as much as they please me. I would disagree that the puzzles and the stories are ill-fitted together. The story, as I see, is in service to the puzzles, and is itself a puzzle. While far more "cookie-cutter" puzzling than Myst, I think it handles its genre impressively. That being said, I'm still itching for the deeper mind-boggling mysteries of Myst and Still Life to appear on the hand-held. I'm a sucker for crazy mysteries. Chris: I think characterizing the story as an excuse to make you solve the puzzles is a fair assessment. They are rarely even tangentially related to the thrust of the plot. But let's be honest here, the story in most shooters is nothing more than an excuse to put things to kill in your path, and there are plenty of games that are perfectly enjoyable without any story beyond the flimsiest pretext of a scenario. "Mario wants to rescue the captured princess from the fire-breathing lizard monster. Full stop." I see Layton as an ode to the old-school brainteaser. Level-5 have no interest in disguising the puzzles as a part of the scenery, they want to showcase them for precisely what they are. I understand that this is an aesthetic that does not appeal to all people, but for a gamer with a strong sense of nostalgia for brainteasers a couple kooky characters and some words and pictures to give my brain a break once in a while is enough. For all of you hoping that this post would inspire people to play the game: it has happened. After hearing so many positive things, I borrowed the game from Jorge. Going in, I felt a bit like Chris. The brain-teaser thing really doesn't appeal to me, as it brings back bad memories of standardized tests and crappy school workbooks. I also enjoy it when puzzles are integrated into the environment, so I wasn't sure how I would like the non sequitur style story. In order to stay engaged, I decided to only play the game with Hanah. That way, we can both laugh at the absurdity of the world and the lack of explanation regarding the puzzles' existence. Plus, she's better at usually better at those types of puzzles, which I'm sure will allow us to stockpile hint coins.